Welcome to Fraser Valley Pride 2019! We have been walking with our youth for many years. 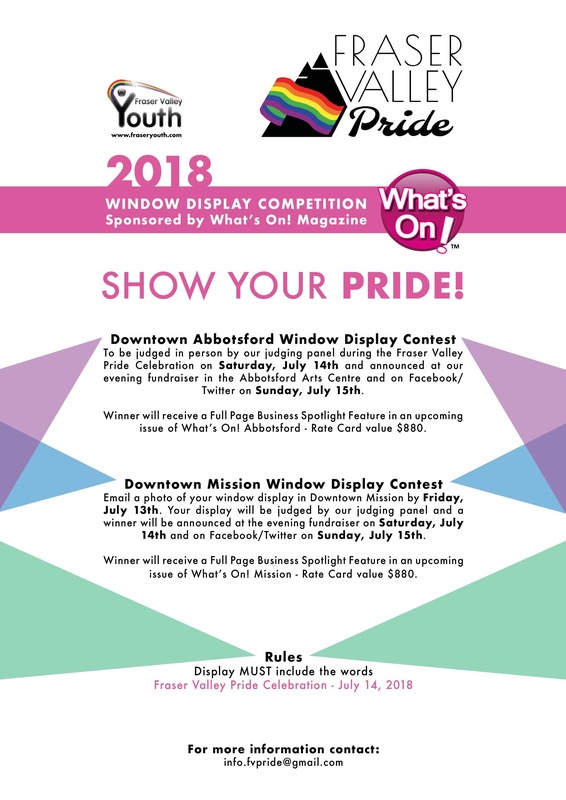 What started out as a walk around downtown Abbotsford and a BBQ in the parking lot of Abbotsford Community Services has become a week of Pride festivities in Abbotsford, Chilliwack, and Mission! We are so proud of how much Fraser Valley Pride has grown since our first official Pride event in 2013. We are expecting Fraser Valley Pride 2019 to be bigger and better than ever! 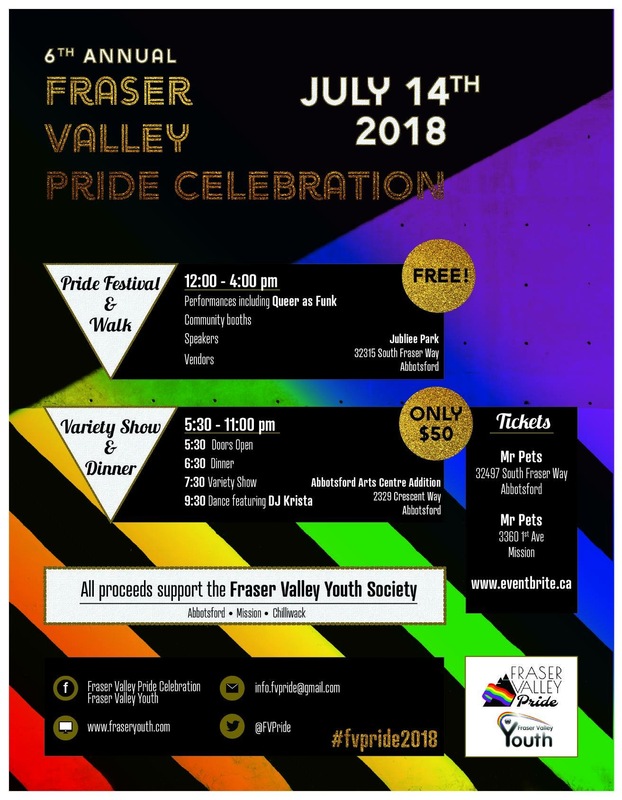 Fraser Valley Youth Society is hosting our 7th annual Fraser Valley Pride Starting on July 12, 2019, followed by our Festival in the Park on July 20th, 2019 We are excited to come together and celebrate diversity with our youth, their friends, families and community members. The 2019 Fraser Valley Pride Festival will once again be held at Jubilee Park with times soon to be announced. It will include a ‘‘Pride Walk’’, products, services and food vendor booths, a community stage featuring performers, and speeches from dignitaries and community members. This is a free, family friendly & open to the public event. There will be a catered dinner, drag show and dance Saturday July 13th, and we are also holding a youth dance on Friday July 19th. Check out the links below for information on the different events, window display contest and opportunities to get involved. Please feel free to contact us at info@fvpride.ca if you have any questions or require any additional information. Want to Get Involved and Show Your Support? This is an excellent opportunity for businesses and organizations to show their support while promoting themselves to a very inclusive and diverse community. In the Vendor Booth package you’ll find the information you need on booth spaces and the application form to set one up. In the Sponsorship Package you will find the the different ways you can get involved such as different levels of sponsorship (event, booth, table, walk, etc) or by a silent auction item, or a straight tax deductible donation. Your business or organization will be recognized as a supporter of our initiatives that have successfully helped LGBTQ2S+ youth in the Fraser Valley. You will gain positive public and media exposure and we will be putting all sponsors, vendors, donors, and volunteers on all our social media pages, program, and website as a big thank you for being involved! Would you like to Volunteer! Do you have an interest in volunteering at Fraser Valley Pride? Well here's your opportunity. We are looking for reliable, motivated, and friendly volunteers to join our team. See the link below to apply. When Pride is over come to our "Thank You Fraser Valley" event on Sunday July 15th for a meal and a thank you from the Pride Committee! Join us at our 7th Annual Pride Celebration, Dinner and Dance. This year we will be hosting a Variety Show showcasing local talent. More info to follow! Join us at our Fraser valley Pride Youth Dance and Drag Show. Friday July 20, 2019.